Gleneagles has completed a £1m renovation of its bedrooms, ahead of its role as host of the 40th Ryder Cup in 2014. Scottish designer Greylines refurbished 36 of the property’s 232 bedrooms as part of a rolling programme of refurbishment at the five-star hotel. The rooms have been updated with a new look that takes inspiration from the heather and woodlands of the local countryside. The design team was also tasked with the creation of three new teenage rooms for the hotel’s younger guests, all complete with PS3 consoles and Langdale chaise longues. 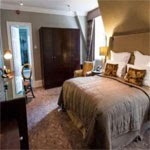 Marguerite Courtney, executive housekeeper at Gleneagles, commented: “The new rooms are already proving very popular. “We’ve tried to bring a little of the outside inside, with modern twists on traditionally Scottish design – for example, a stylized thistle pattern in the carpets, feature walls that depict outdoor scenes and a colour palette inspired by the Perthshire landscape. New features in the refurbished rooms will also include in-shower “feature walls” portraying scenes from the hotel’s championship golf courses, 39in televisions, under-floor heating and headboard reading lights, Zoffany soft furnishings and environmentally-friendly LED lighting. Recent new developments to be unveiled at Gleneagles in recent years include a £3m overhaul of its Dormy Clubhouse in 2011, the installation of a new outdoor whisky and cigar bar called the Blue Bar in the same year, and a £1m investment in its PGA Centenary Course in 2012.